When you think about the things necessary for the life cycle of a tree, you likely think about good nutrient-rich soil, plenty of rainfall, and, naturally, abundant sunlight to nurture the sapling into a towering adult tree. What you likely don’t think of is fire, the forest leveling enemy of trees everywhere. Yet for some tree species, fire is a critical part of their life cycle and without forest fires, they would die off. Lodgepole pines (also called shore pines), a common type of tree found all over western North America, are one such example of a fire-adapted plant species that relies on the fire ecology created through natural or controlled forest fires to propagate future generations. 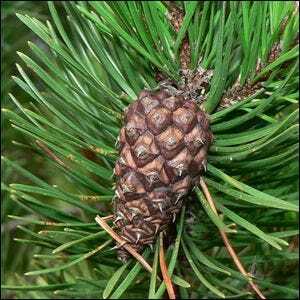 The pine cones of the lodgepole pine are sealed tight by a strong resin that only melts away in the presence of intense heat, opening up the fins of the pine cone and releasing the seeds. The adaptation is believed to have evolved as a way for the lodgepole pine to get a leg up in the ecosystem—after the fire has wiped out the forest, the freshly released seeds can grow in the open spaces free from competition. Photo courtesy of Walter Siegmund/Wikimedia.